Lance, I watched your YouTube video "half squat with transition emphasis". Is this video teaching how the half squat should generally be done? I mean would doing a half squat with a transition emphasis be a good squat to start doing for a basic general strength exercise? Thanks for your time man. You got some nice informative videos on your YouTube channel. Lance, I watched your YouTube video "half squat with transition emphasis". Is this video teaching how the half squat should generally be done? I mean would doing a half squat with a transition emphasis be a good squat to start doing for a basic general strength exercise? Thats showing how we use the half squat, as a supplementary exercise for speed and power. 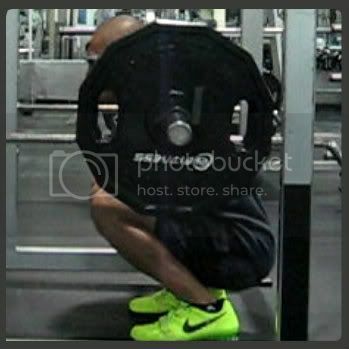 Its definitely not a basic general strength exercise, you need to full squat for that. We use those when someone has a combine/track meet/ season coming up that they need to peak power for. Thanks for your time man. You got some nice informative videos on your YouTube channel. too much heavy half squats as a suggestion from lance got me full repping 455 out of nowhere. i had no idea it had a strong training effect..
all i can do now is watch what i did 1 year ago and say - at least i got it on vid.. not gonna happen that easy again anytime soon. Thanks for the quick reply Lance. Haha nice vid KingFish. Got some serious strength!! It's time for me to get back to the squat rack after a 8 month layoff from the back squat, I still jump roughly the same though. You were much heavier then. Did the first part of the video, where he streams his body weight across the screen give him away?